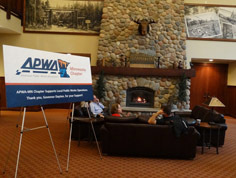 Public works personnel ventured to the Nisswa area May 7-9 for the APWA-Minnesota Chapter 2014 Spring Conference. The three-day conference gave attendees a scientific look at employee engagement in the work place, updates on the organization, and an overview of current public entity initiatives across the state of Minnesota. The conference began with an update on National APWA activities from Larry Stevens, who recognized the achievements of the Minnesota Chapter (10 national awards!) and touched on an initiative to bring more attention to the important roles public works employees play in emergency response situations. Next, Don Rheem led a two-part physiological journey on working to actively engage employees, optimize performance and output, and create a highly-functioning team in the workplace. Finding ways to create a trusted, actively engaged work environment can increase productivity and begin to create customer loyalty. Rheem led discussions and guided brainstorming sessions through which small groups had an opportunity to share different managerial methods to help create an actively engaged team. Ultimately, the message and ideas presented work towards creating synergy amongst a staff that can open communication channels and improve the public perception of the public works profession. Unfortunately, weather conditions were less than favorable and the technical tour was canceled. The tour was set to educate professionals on how to plan and support more bike friendly communities. To learn more, download the presentation (pdf). A special thanks to all the speakers, committees, volunteers, and APWA-MN members who worked hard to put this conference together and to all of the people who were able to attend. Be sure to check out photos from the conference in the Photo Gallery!